President Donald Trump has been criticizing the Federal Open Market Committee for raising interest rates. The reaction of the US equity markets is self explanatory. But while the economist love cult in the Big Media may take umbrage at President Trump’s critique of the central bank, in fact Trump is dead right. First, the Fed’s actions in terms of buying $4 trillion in Treasury debt and mortgage paper has badly crippled the value of the fixed income market as a measure of risk. The Treasury yield curve no longer accurately describes the term structure of interest rates or risk premiums. This means that the Treasury yield curve is useless as an indicator of or guide for policy. Nobody at the Federal Reserve Board understands this issue or cares. Second, Operation Twist further manipulated and distorted the Treasury market. By selling short-term paper and buying long dated securities, the Fed suppressed long-term interest rates, again making indicators like the 10-year Treasury bond useless as an measure of risk. Without QE 2-3 and Operation Twist, the 10-Year Treasury would be well over 4% by now. Instead it is 3% and change and will probably rally to test 3% between now and year end. Third is the real issuing bothering President Trump, even if he cannot find the precise words, namely liquidity. We have the illusion of liquidity in the financial markets today. Sell Side firms are prohibited by Dodd-Frank and the Volcker Rule from deploying capital in the cash equity and debt markets. All bank portfolios are now passive. No trading, no market making. There is nobody to catch the falling knife. The only credit being extended today in the short-term markets is with collateral. There is no longer any unsecured lending between banks and, especially, non-banks. As we noted in The Institutional Risk Analyst earlier this week, there are scores of nonbank lenders in mortgages, autos and consumer unsecured lending that are ready to go belly up. Half of the non-bank mortgage lenders in the US are in default on their bank credit lines. As in 2007, the model builders at the Fed in Washington have no idea nor do they care to hear outside opinions. 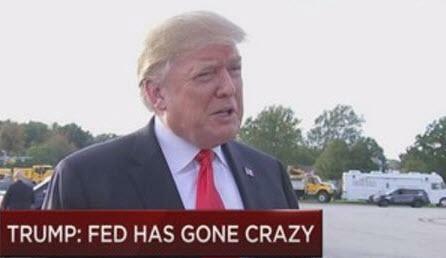 If you understand that the Fed’s previous “extraordinary” policy actions have the effect of understating LT interest rates by at least a percentage point, then you know why President Trump is howling like a wounded hound. Nobody understands the danger of leverage better than a real estate developer. When you see the dislocation and distress visible to those with eyes wide open in the non-bank residential and, especially, multifamily mortgage sectors, then you know why President Trump is rebuking the Federal Reserve. Bottom line: We fully expect to see some business failures in the residential lending and multifamily development sectors over the next 12 months. The real estate markets are over-extended, asset prices are silly and the only way forward for debt and equity valuations is lower. More important, if the "real" rate for the 10-year bond is over 4%, then where should the Dow and S&P be tomorrow at the opening? By raising short-term interest rates instead of unwinding QE 2-3 and Operation Twist, the Fed is repeating the mistakes of 1928 and is creating the circumstances for a liquidity crisis.